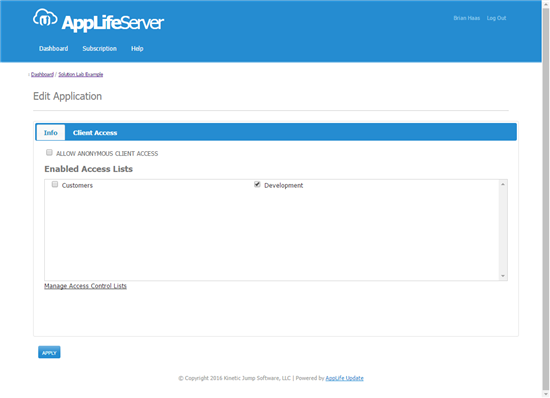 This solution lab will walk through the steps necessary to start an AppLife Update subscription, configure your application to discover updates from the cloud server, and create an update project to publish updates for your clients to discover and apply. 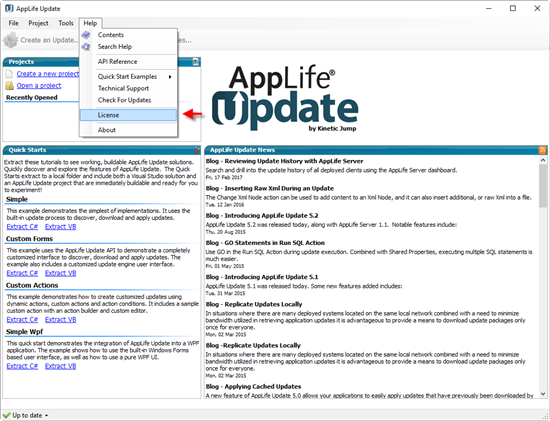 Signing up for Hosted AppLife Update provides the entire AppLife Update solution plus online update hosting for a low monthly subscription. The subscription starts at just $20 per month for applications with fewer than 100 active clients. To sign up, visit the AppLife Update store and follow the links to subscribe. 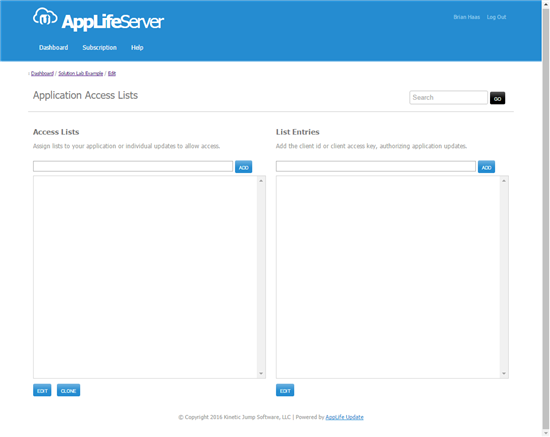 With this information we can visit the AppLife Update dashboard for the first time, configure the application, configure an application to discover updates here, and publish our first update. To log in, visit https://www.applifeupdate.com. Enter your username and temporary password. You’ll be prompted to change your password the first time. Once logged in, you’ll see your dashboard. 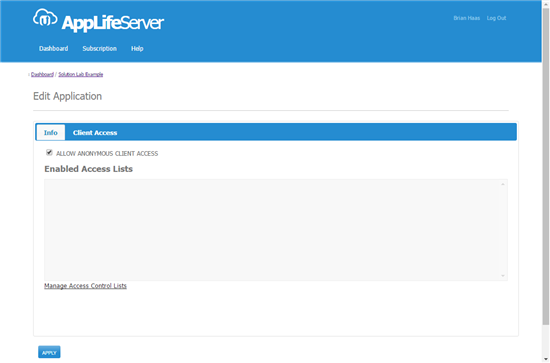 From your dashboard you can manage all of your applications and your deployed client installations. At this point there isn’t much here to look at. The first thing we might want to do is rename the application. By clicking the 3 bar icon to the left of the application name, we’ll open the individual application view. Again, not much to look at yet. But from here, we can access the application details, where we can change the application name and manage access control at the application level. Clicking the Application Icon opens the details page. Here we can change the name to match your application. I’ll change this application to Solution Lab Example. While we are here, let’s look at Client Access configuration. And in the Development list, I’ll add a Client Access Key value of BHDevInstall. We’ll use this value when we configure our first client to check for updates. 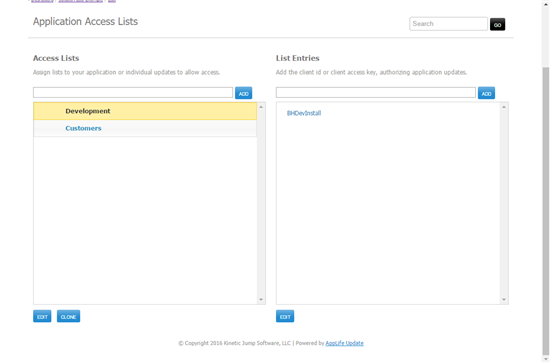 So after editing Access Control, Development entries can access update at the application level. 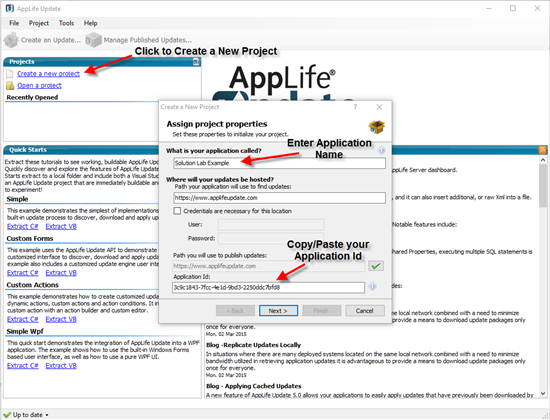 If you haven’t installed the AppLife Update software, download the installer using the link in your email. After the software is installed, apply the license key that was in your email. With your software licensed, let’s create a new project file for this application. When we create the application project file, we need to copy/paste the application Id that was provided in your provisioning email. 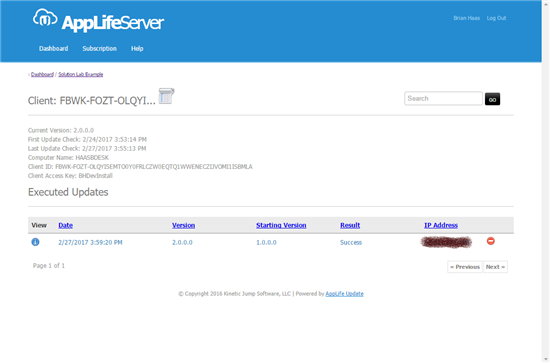 You can also enter your AppLife Server credentials if you prefer to persist them and not enter them with each update publish. This is all we need to set. We can accept the defaults throughout the rest of the wizard. IMPORTANT: Once you create your project file, back it up to some place secure. The project file contains the private key that is required to publish and update. If you lose your update project file, you will not be able to create an update that your deployed software will be able to install. Your software will use an Update Controller to discover and download update packages. 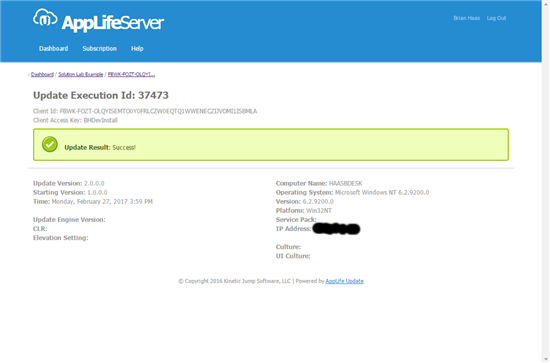 The Update Controller API is very flexible and can be used in many ways to manage and maintain software installed on any Windows platform. 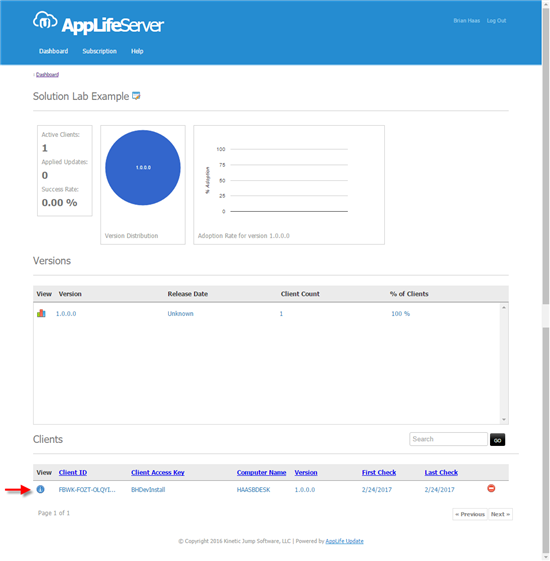 This solution lab is focused on getting started with the AppLife Update Cloud and subscription model and will keep the client integration very simple. 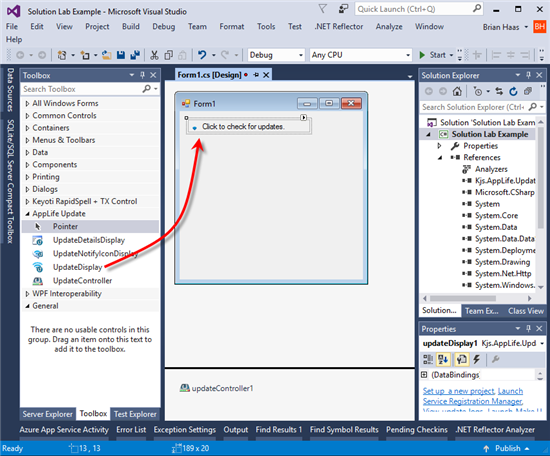 With Visual Studio, create a new Windows Forms application. Open the default Form1 in the designer. 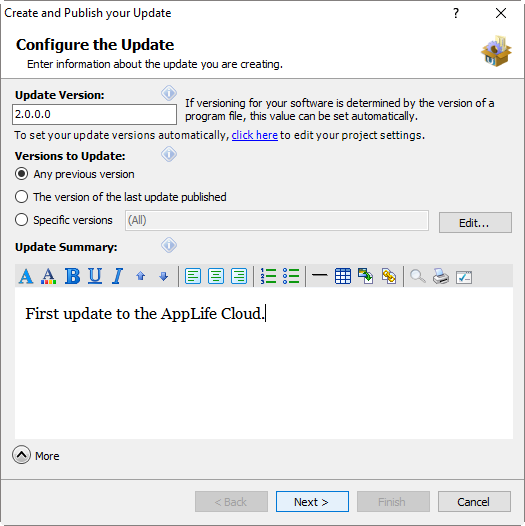 In the Visual Studio toolbox, you will have an AppLife Update section. 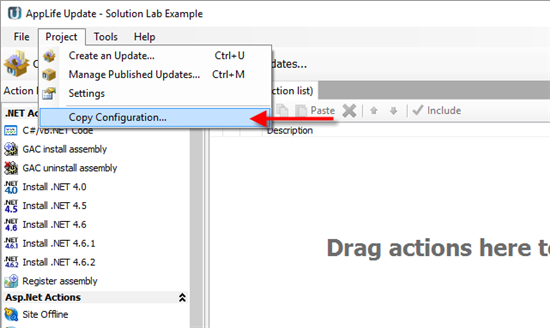 Drag from the toolbox an Update Display control and drop it onto the Window. The AppLife Update project has an easy way to set these values. 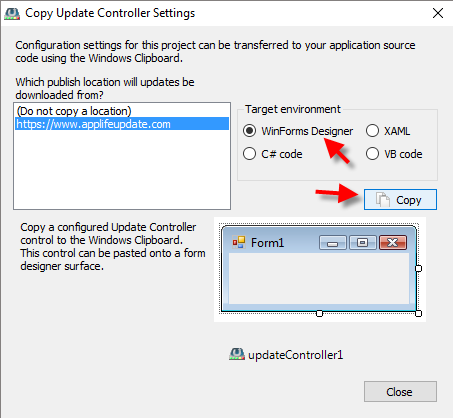 Copy the WinForms designer information to the clipboard. 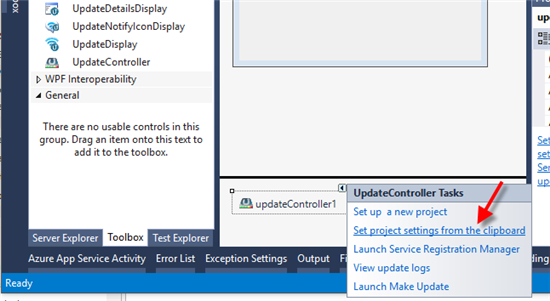 Within Visual Studio, we can just paste them into the Update Controller designer. This will set everything we need, except the Client Access Key. If we build and run now, we would see that this client does not have access. 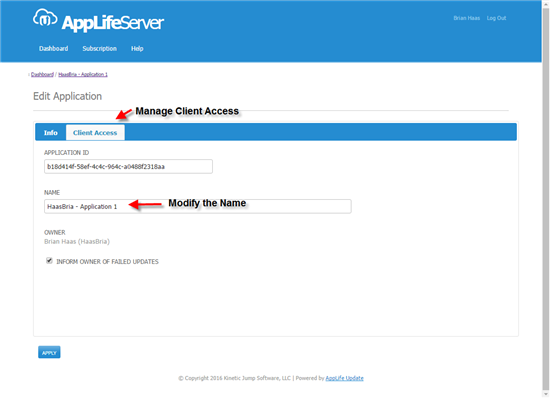 If we add the Client Access Key that we created early within the AppLife Server Dashboard (BHDevInstall), this client will now successfully be checking for updates. 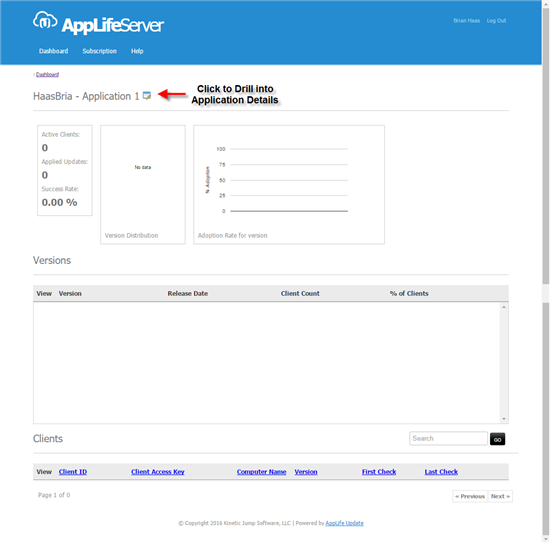 And if we return to the AppLife Server dashboard, we’d see one active client. We can drill into that active client by clicking the blue information icon. We haven’t executed any updates yet, so not much to see. So let’s go publish an update. 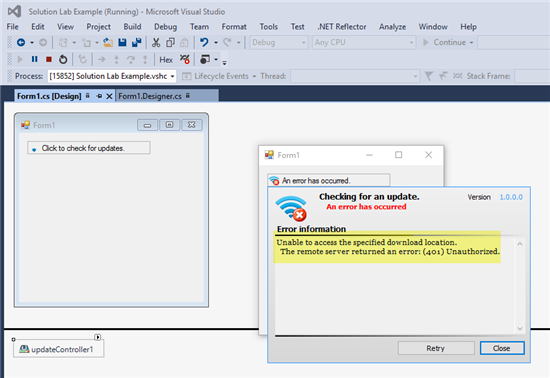 I’ve built a new version in Visual Studio and now will create an update that will replace the executable. To do, I’ll add an Add & Replace Files action to my update project. 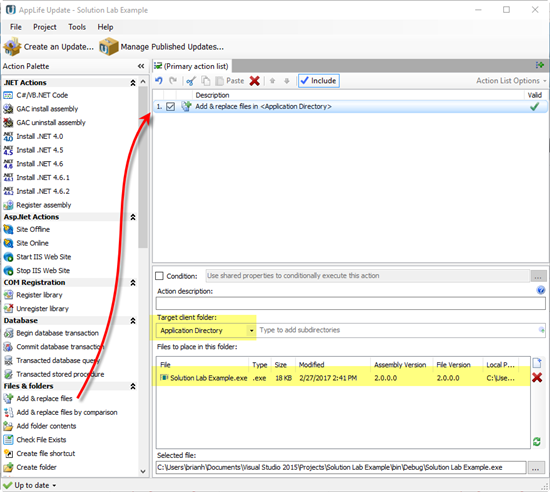 Notice that the Target client folder is set to Application Directory. This action will place this file in whatever folder the application is running on the deployed client. 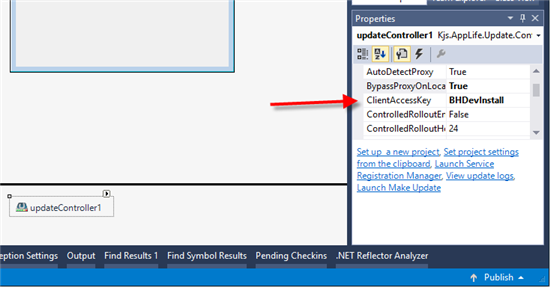 Also notice that the action is picking up the new executable from my Visual Studio projects bin directory. This path can also be relative to the aup project file. 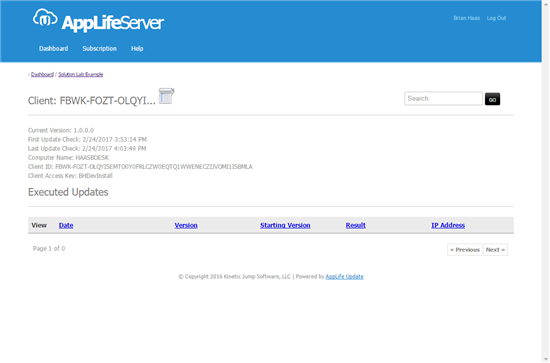 So with the update action configured, I’ll publish an update to the AppLife Cloud. When I launch the Publish wizard, I need to provide a few pieces of information about the update. The first is the update version that we are publishing. This is version 2.0.0.0. The next is the target version. 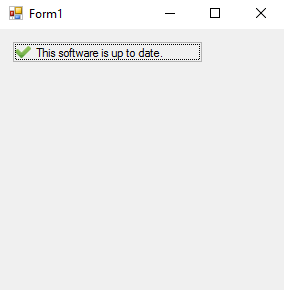 What previous versions of the software can successfully apply this update? Because our example has only a single executable and we are replacing the entire file, any previous version can apply the update. On the next screen, I can specify which deployed clients can see this new update. To do so, I change the Version Access Mode to Version and I check the Access Control Lists that should have access. I can change these settings from the dashboard later. And now to build and publish. We’ve published the first update. Now our application will be able to see an update to apply. Clicking on the control will shut down the application and initiate the update to version 2.0.0.0. 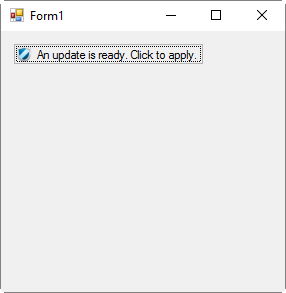 When the update completes, the application restarts. Back in the dashboard, we can see that this update was executed. 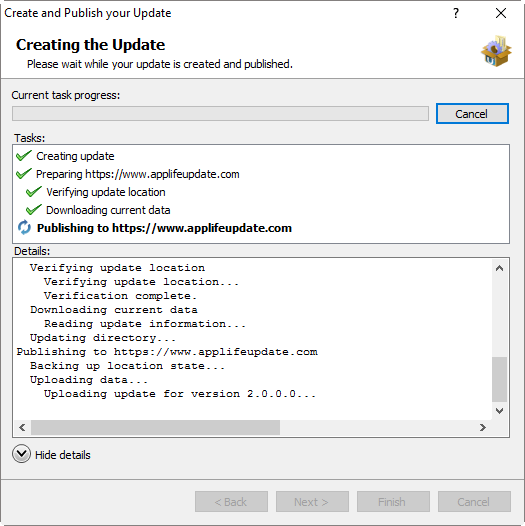 It’s quick and easy to get started using AppLife Update Online. 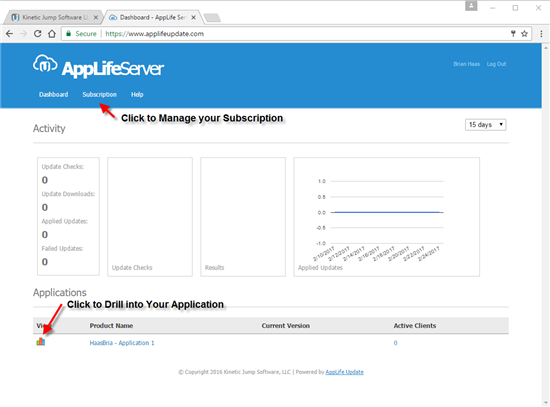 After subscribing, you can quickly configure your application for updating using one of the many built-in update process controls or use the Update Controller API to completely customize the process. 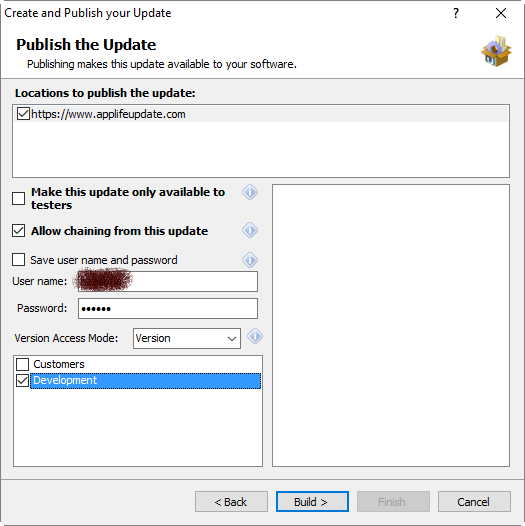 With a process implemented, building and publishing updates is very easy using AppLife Make Update.